Music sheet illustrations are interesting pieces themselves aside from the music that they are covering. They are very detailed, and although the picture usually dominates the page, they do contain all the information about the piece of music, from the lyricist and the composer to the artist and the performer. 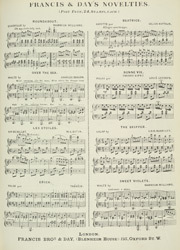 Popular music from the 19th Century ranges in length from as little as one page to twenty sheets and was generally sold in folios measuring a standard 370mm x 266mm.